Yahoo provide free and popular basic email services. If you want to create a new yahoo email account go to the Yahoo mail homepage at mail.yahoo.com. If you are outside the USA you should automatically be redirected to a local Yahoo site. 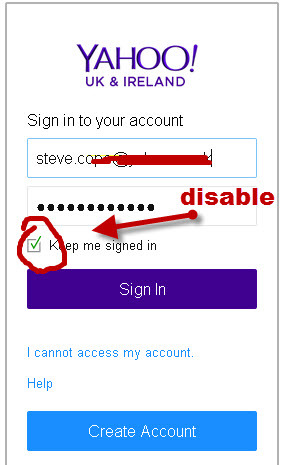 Click the Sign Up link next to New here and at the bottom of the login form under Don’t have a Yahoo ID is a create New Account button. When you click the button you are presented with a form that you need to complete. It asks for your date of birth – I don’t give my exact DOB because of security concerns. If you don’t want to give yours then use a memorable date and stay in the approximate year/month to your real one. I also don’t give my exact postcode but again it is near. You will get a confirmation form with all the details that you have entered make sure you print it and store in safely you may need it at a later date if you have problems with your account. 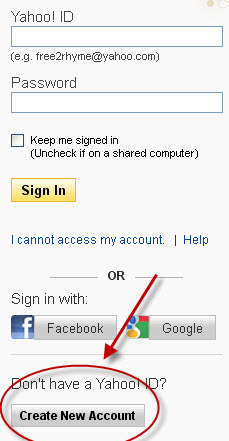 The email address and Yahoo id are the same.Below are some guidelines on choosing an email address. You can have the standard Yahoo.com or use country specific yahoo domains like yahoo.co.uk (UK) and yahoo.de (Germany). When you sign up for the yahoo account you can select the domain name. You can try prefixing or post fixing words/numbers to your preferred email address, but don’t use anything silly, and that you would be embarrassed with if you had to give your address to someone. You can also separate names with a full stop. So try joe.cope@yahoo .com and if you have a middle initial then you could try. You should note that your Yahoo id and Yahoo email address are the same. Don’t risk having your account hacked by using easy to guess passwords. See this tip –how to create easy to remember and secure passwords for a guide. Most people will access their Yahoo email account using a web browser. 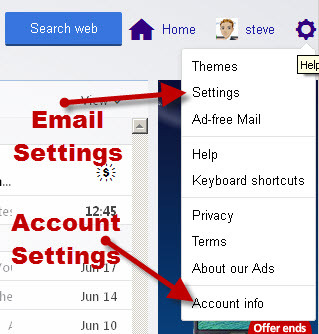 Yahoo provides a toolbar for the main browsers which makes it easier to access email as well as other Yahoo services. If you don’t want to install the toolbar then you can manually enter the mail url in the browser address bar, use a bookmark or a desktop shortcut.. The mail url is mail.yahoo.com but you will probably get redirected to a regional page (e.g.UK) depending on your location. The keep me signed in check box is usually enabled by default, but I prefer to un-check this. Your browser might ask to remember the login details, and I usually accept this, but you should only do this on computers you own, and not on a public computer or a friends computer. In the top right hand corner of the Yahoo home page you will find two links. The Mail icon may have a number inside a red circle next to it. This number is the number of unread email messages in your inbox. Click on the Mail icon to go to your Yahoo mailbox. In the top right hand corner you will see a purple wheel icon. If you place your mouse over this a drop down menu appears. Click in gear icon to open the drop down tab and click account info to open a new window to manage your Yahoo account settings. Contact Phone – Used for security. Make sure you verify the phone number. Change Password – You should do this if you think your password is weak and if possible on a regular basis for better security. Q – I’ve forgotten my Yahoo email password what do I do? A –You can try to find your old password or as a last resort you can reset your password. Q- I want to create a new Yahoo mail account but I have one already, Can I still create a new account? Q- What is the difference between a Yahoo ID and a Yahoo Email Address? Q- How do I get my old emails from my old email account to the new account? A- There are various techniques to doing this. 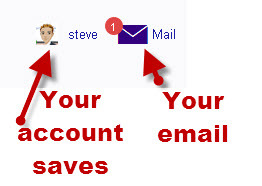 The choice depends on your old email account, and what you want to keep or transfer to the new Yahoo account. See Changing email providers and How to export email messages from Yahoo Mail. Q- Can I access my Yahoo mail on my Mobile Phone? Q- I live in the UK can I have a .com Yahoo email address?